Frosted Plastic Gift Bags with Cardboard Inserts, 6.25x3.5x16"
Clear frosted plastic gift bags with die cut handles are great for both lightweight and heavy products. The cardboard inserts add to the strength of the bags and also help them to stand more upright. Tall boxes, home decor items, and souvenirs are just a few of the items that fit securely in this strudy bag. Each bag is made from 3.0 mil frosted plastic and measures 6.25xx16" with a 3.5" gusset. Bulk packed in cartons of 250. 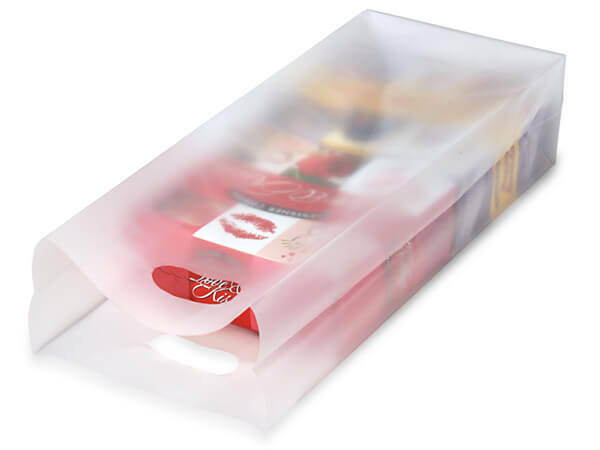 Frosted Clear Merchandise Bags with die cut handles are made of strong frosted hi-density polyethylene. All sizes have secured cardboard insets that stay in place. Use over and over again!